The Islamic militant group Hamas staged a show of strength to mark its 27th anniversary Sunday, with a military parade through Gaza including a flyover by a drone. Founded in 1987 shortly after the start of the first Palestinian intifada, or uprising, Hamas was inspired by Egypt’s Muslim Brotherhood. Its charter calls for the eventual destruction of Israel and the establishment of an Islamic state on the pre-1948 borders of the British Palestine Mandate. The Jerusalem Post said the Israeli air force scrambled warplanes to monitor the Hamas drone, which did not cross into Israel. “According to a military source, the jets were prepared to deal with the threat, but returned to base after the air force saw there was no threat to Israeli air space,” the Post website said. An Israeli military spokesman confirmed the drone flight but would not comment on Israeli reaction. On the ground, rocket and mortar launchers trundled through the rain-swept Gaza streets along with thousands of masked, black-clad and helmeted fighters of Hamas’s military arm, the Ezzedine al-Qassam Brigades. Lorries carried larger rockets, such as the locally produced M75, which have a range of 80 kilometers, meaning they can reach Jerusalem and Tel Aviv. Frogmen of the Brigades’ naval commandos posed in wetsuits and other militants rappelled down the walls of a building. Qassam spokesman Abu Obeida praised Iran for its support. “Thank you to all the people and the countries, first among which is the Islamic Republic of Iran which did not skimp on money, weapons and other things and provided the resistance with rockets,” he said in a speech. During seven weeks of war this summer between Israel and Hamas, the main power in the Gaza Strip, militants fired 3,659 rockets or mortar rounds on Israel, the Israeli army said. The army said it hit 5,226 targets in Gaza, with air strikes, shelling or tank fire. The Gaza health ministry said 2,143 Palestinians were killed, nearly 70 percent of them civilians. On the Israeli side, 73 were killed, mostly soldiers. During the conflict the military said it shot down two Hamas drones over Israel. 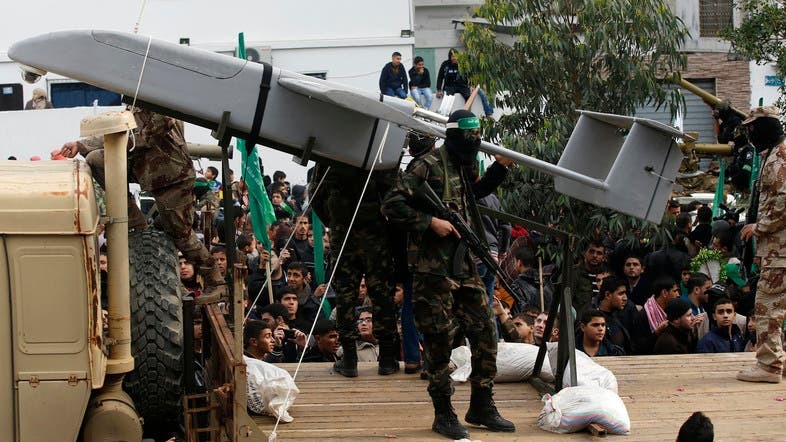 Qassam says the “Ababil” drone is manufactured in Gaza. In 2012, during a previous major operation against Gaza, Israel said it had destroyed a military drone production workshop set up by Hamas.